Many years ago 2 of our boys were active Cub Scouts. It was so very cute...but that's not what I'm talking about today. Actually, from way back we had begun to formulate a lifestyle of learning in our family, and being that the boys were so interested and engaged in their badge work, I decided to take a closer look and see what kind of educational value I could squeeze out of them. Turns out, I found quite a bit! And for most of their elementary years, we incorporated the activities for pins and badges into their school work. Lots of great hands-on learning took place, and some warm family-fun and family learning as well. 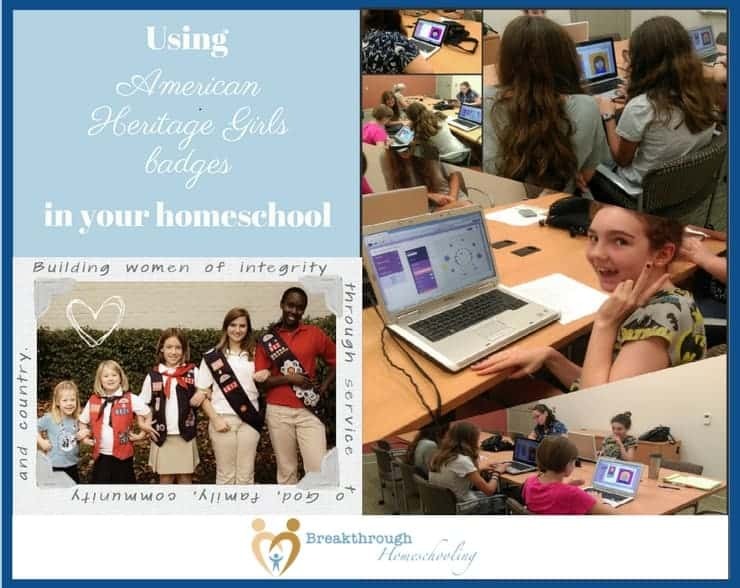 Fast forward a few years, and I had the privilege of getting a local American Heritage Girls troop started, chartered and supported by our homeschool support group. If you're not familiar with them, AHG can be described as a girls' scouting program with a heavy Christian emphasis. As a youth, I participated in a Girl Scout troop all the way to a Senior, and had always hoped one of my daughters would enjoy scouting experiences as I had. After my oldest opted out after a year or two, however, I hesitated to push our younger daughter too much. "Building women of integrity through service to God, family, community, and country"
But she seemed to "take" to AHG, which, after becoming aware of some of the current, more philosophical developments in GSUSA, I was happy to see! As we moved ahead with the formation of our new troop, and the girls and moms began to bond and feel like family, it became apparent this was going to be a good fit. As we moved on, I began to take a similar attitude towards incorporating school and badge work. This time, however, our daughter was a bit older than our sons had been, so I was looking for more educational "meat." Lucky for us, AHG didn't disappoint! Now with my daughter squarely in middle school, I took the time to go through the 6 areas that AHG covers in their badges, as well as the sports pin program and Level Award opportunities they offer as the girls move up. they incorporate a balance of "academic" learning (through research and thought) and practical learning through participation in activities. they also provide a nice balance between personal and group learning, a nice "plus" for homeschooling families. the girls often get the opportunity to present the results of their personal studies to the troop, giving them a chance to develop skills in doing presentations and public speaking. 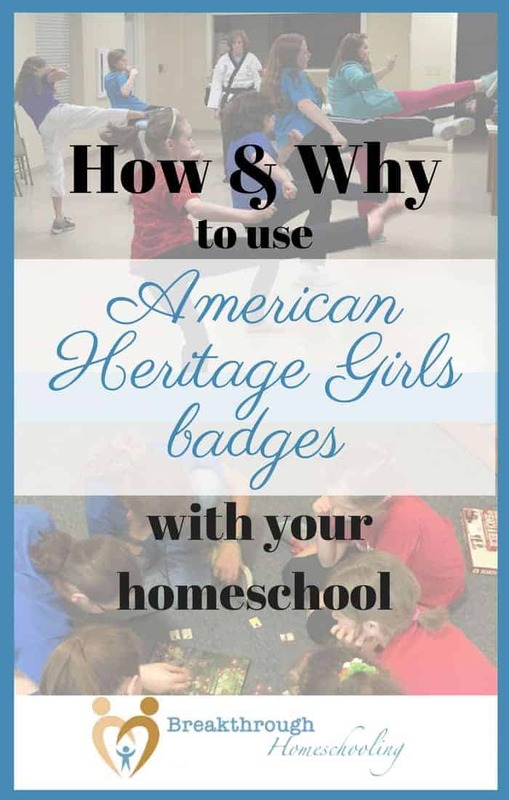 Below you'll find a layout connecting many AHG badges to subjects taught in middle school, and then an outline connecting badges to potential high school elective classes as well. At the middle school level, this includes Tenderhearts, Explorers, and young Pioneers. 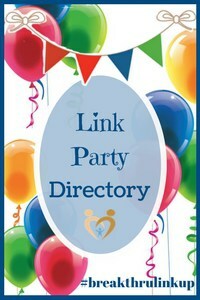 Pin this post for future reading and sharing! At the high school level, this includes older Pioneers and Patriots. Sign Language - This may be considered a Foreign Language credit for some colleges. It's worth looking into if your daughter is seriously interested. Kid Kare | Money Management | Family Helper | Home Care and Repair - Combine these badges to make a robust course which you can call "Family Life" or "Life Skills" on their transcript. If you have any questions or experiences of your own that would bless or encourage others, please do leave them in the comments below! 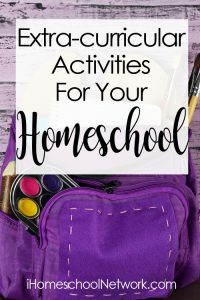 Find more ideas and support for using extra-curricular activities in YOUR homeschool! So glad you found us 🙂 What an ambitious goal – blogging about your learning adventures! I think you’re off to a great start, tho!! I’ll keep checking in with you… And feel free to share your posts at our Coffee and Conversation each week – it’ll be fun to see your cute little kiddos learning! I’ve always heard snippets about AHG, but I’ve never really seen the details laid it out so thoughtfully. Totally helpful; thank you! As a home school mom I echo what has been said here. AHG has enriched our homeschooling. As an AHG Troop Coordinator I wanted to say that I share this post often with both homeschooling and public school families and everything between. Thanks for the kind words, Michelle, as well as the promo!! Yes, I have to say that AHG really gave a “boost” to my daughter’s character and studies in her middle school years. I encourage anyone I know to get involved if they can!